Type 45 Anti Air Warfare (AAW) Destroyers are getting ready to join the Royal Navy. Six of Type 45 AAW Destroyers are to succeed the long serving Type 42 destroyers, commissioned between 1975 and 1985. Type 45 AAW Destroyers are expected to provide specialist air warfare capability upto 2040. The six ships to join the Royal Navy are: HMS Daring, HMS Dauntless, HMS Diamond, HMS Dragon, HMS Duncan, HMS Defender. The ships are being built on the River Clyde using innovative modular construction method by BVT Surface Fleet, the shipbuilding joint venture owned by BAE Systems and VT Group. The ships are designed to provide the best accommodation ever seen by the Royal Navy on a warship with a 39% increase in individual crew space. The crew complement is 190 and can be to a maximum of 235 depending on the mission. Facts and Figures are here. Seventh ship to bear the name. Motto is: ‘Splendide Audax’ (Finely Daring). Launched at the BAE Systems, shipyard in Scotstoun on February 01, 2006 by HRH the Countess of Wessex. Commenced sea trials on July 18, 2007. Final contractor sea trials are over in September 2008. To join the Royal Navy by 2009. Video clips are here: launching, sea trials, tour. 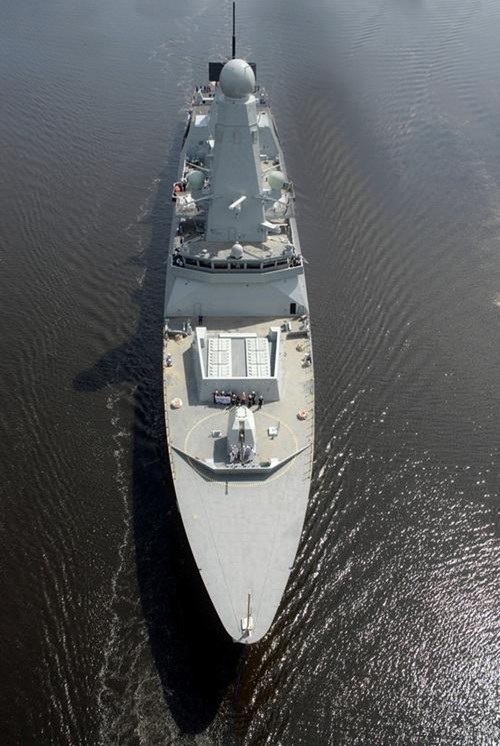 Here is a photograph of HMS Daring during sea trials from the Royal Navy. Fifth Royal Navy ship to bear the name. Launched on January 23, 2007 by the Ship’s Sponsor, Lady Mary Burnell-Nugent. Undergoing her first set of contractor sea trials from November 2008. Launch video clip is here. Launched on November 17, 2008. Launch video clip is here and here. 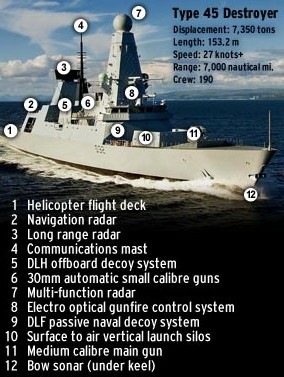 HMS Defender (D36): To join by 2012. The bow section for this final Type 45 Destroyer has reached BVT Surface Fleet’s facility in Govan during the first week of December 2008. Here is an interesting video clip of Type 45 AAW Destroyers. Here is the photo gallery of Type 45 AAW Destroyers from the Royal Navy. Read more about HMS Daring from BAE Systems and read more about progress of Type 45 AAW Destroyers from BVT Surface Fleet. All the above images are from the Royal Navy and for more information on Type 45 AAW Destroyers, log on to Royal Navy. The £605m HMS Daring – officially handed over to Royal Navy and is expected to join service by January 2009. Read more from BBC News and MOD UK News. 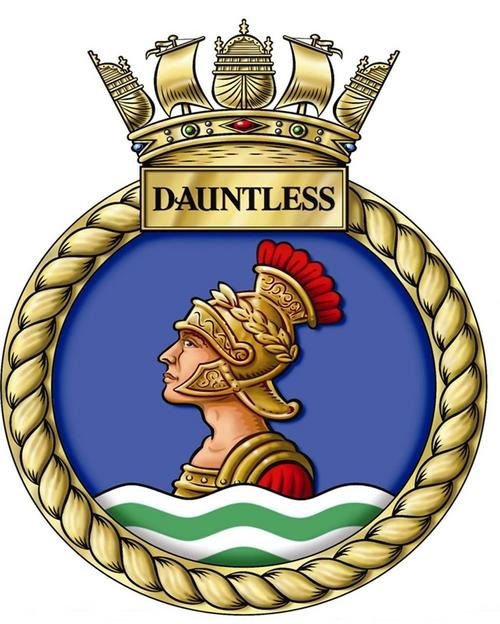 HMS Dauntless has successfully completed First set of Sea Trials in December 2008 before Christmas. Read more from MOD UK News. HMS Daring, the first of the new Royal Navy’s Type 45 destroyers, entered Portsmouth and berthed for the first time in her home port. HMS Daring will undertake an intensive sea trials programme for the rest of the year and the formal commissioning ceremony is expected to take place in the summer with a target of formally accepting her into Naval Service by late 2010. Also the Principal Anti-Air Missile System (PAAMS) of Type 45 destroyers is now officially named as “Sea Viper”. Read more from the Royal Navy. National Audit Office (NAO) report says that despite significant delays and escalating costs the Royal Navy’s Type 45 destroyer programme has more recently progressed well, with key milestones being met. Read more from MOD, UK News. HMS Daring was commissioned on July 23. HMS Daring will be based in Portsmouth. The second, HMS Dauntless, is due to make her first entry into Portsmouth early next year. Read more from MOD, U.K.